Moroccan food is considered some of the best in the world. The easiest way to discover the true flavors of Moroccan cuisine are to take a Moroccan cooking class or explore various restaurants in Morocco’s Imperial Cities such as Marrakech, Fes, Rabat or Essaouira on a Morocco tour. Another way to discover authentic Moroccan cuisine is to dine with a local family in a Berber Village. Berber villages are known for their unique fare as result that their main staples in making Moroccan traditional cuisine such as couscous are grown locally in their fields alongside special herbs which allows for amazingly tasteful food. 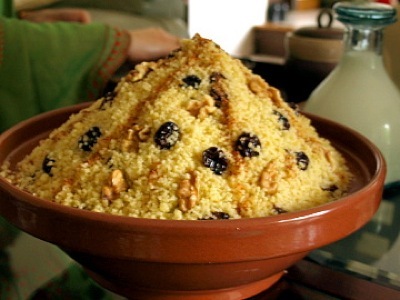 Moroccan recipes such as baking bread by fire and a tajine on starlit night can be learning on a Sahara desert tour to the Erg Chebbi Dunes of Merzouga whereby your camel trekking guide takes you off on a journey into the vast dunes to a Sahara camp at sunset to learn the secrets of the Sahara. To fully enjoy a Moroccan meal one must arrive with an empty stomach and then fully prepare themselves for a three or four-course Moroccan feast. As the French proverb says, “Appetite comes with eating; the more one has, the more one would have” so make sure to visit Morocco with an open palate and a big appetite! This menu and choice will give you a real taste of Moroccan food. Many variations are available. Season the meat with salt, pepper, cumin and a touch of cinnamon (or salt pepper and ras al hanout, if you have it). If you can let is sit in the refrigerator for an hour or so, do so. Bring the meat to room temp (20 min) before cooking as desired. Cook cleaned and sliced carrots as usual (in small amount of cold water, bring to the boil, simmer until tender, appr. 6-8 minutes). Drain. In bowl add carrots, cumin, paprika, cinnamon, lemon juice or vinegar, salt, pepper, olive oil and chopped parsley. Taste and adjust seasonings. Serve warm or at room temp. Cook couscous with small handful raisins according to package. Fluff with fork. Add lemon juice, cooked chickpeas (from the can), chopped herbs such as cilantro, parsley or mint, salt & pepper to taste. Serve hot or room temp. Peel oranges. 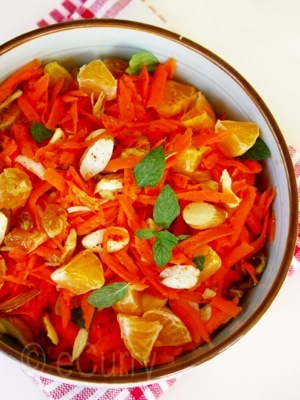 Either slice or segment (supreme) oranges in a bowl. Add cinnamon, sugar or honey and ½ teaspoon rose or orange flower water. Let stand in refrigerator one hour. Taste and adjust seasonings.